Run for Money Toshochu: Escape the Greatest Hunters in History is one of the most popular 3DS games released in Japan in 2012. 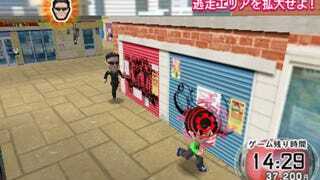 Just like the popular Japanese game show it's based on, Run for Money pits players against Matrix-like agents (called "hunters") in an over-the-top game of tag. What results is a game that is simple to play yet evokes memories of some of the greatest classic games in history. When trying to describe how exactly Run for Money plays, perhaps the most apt description is to call it a mix between Pac-Man and Mario Kart. Just like in Pac-Man, you must try to avoid the enemies hunting you as you collect items (coins, collectables, etc.) and try to survive as long as possible. On the Mario Kart side, each stage is covered with item boxes that contain a variety of useful gadgets. These range from banana peels and oil slicks (which temporarily trip up pursuing hunters) to speed boosts and invisible potions. In Run for Money, the gameplay styles of these two classic games come together to make a game that is both easy and fun to play. Perhaps the greatest addition to Run for Money's Pac-Man/Mario Kart aesthetic are the game's numerous missions. As you play any given stage, you will be given a new mission every few minutes. These missions do everything from awarding bonus points to making hunters disappear—and perhaps most importantly, open up new areas of the map for you to hide in. But the best part about these missions are not the rewards; it's that they give you an immediate goal. The missions keep you occupied and give you a reason to keep moving around instead of just finding a corner and hiding until the clock runs out. On the downside, though, there is little in terms of mission variety. The missions are pretty much all fetch quests: go here, talk to this person, get the item, and take it to someone else. Repeat ad infinitum. Camera control is automatic in Run for Money and it does its best to stay in the area above and behind you. The problem is, as this is a game where you often need to turn suddenly to avoid a chasing hunter, your camera will often find itself inside the walls of the environmental objects—effectively blocking your view for a critical second. This awkwardness carries over into the item controls as well. Most items like oil slicks or invisible potions don't require you to aim, but when you do have an item that requires you to throw it, turning quickly and hitting your target can be a little difficult. Moreover, switching items is done via the D-pad, meaning you can't move and change items at the same time without some clever hand contortions. I was truly surprised by how much I enjoyed Run for Money Toshochu: Escape the Greatest Hunters in History. I expected a cheaply-made, boring tie-in to a popular TV show and instead got a fun little game that reminded me of bygone classics. It does have a few small issues with the camera and controls, but I had fun with the game despite its downsides. If you're a fan of Pac-Man, Mario Kart, or the Run for Money TV show (and have a Japanese 3DS), this is a title well worth picking up. Run for Money Toshochu: Escape the Greatest Hunters in History was released in Japan for the 3DS on July 5, 2012. There are currently no plans for an international release.